Sponsor: A Friend of F.I.S.H. Beaux Vine is bright, sparkling, and covered with flowers and vines. I imagine that Beaux Vine is out in the fields, at the end of a summer day working on the farm. He is one with nature, surrounded by beautiful wildflowers and vines. He sparkles like the stars of the night sky. My inspiration for Beaux Vine is from bright and colorful Mexican Folk art. 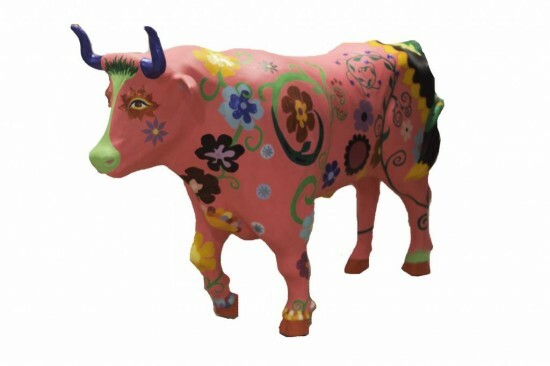 Folk art is often both utilitarian and beautiful, in design and color. The fields full of wildflowers in Hopewell and the bright stars in the Puerto Rican night sky were also inspirations for this project. To make Beaux Vine beautiful, I used acrylic paints, acrylic gloss medium and varnish, and glitter.